Allnigeriasoccer.com rounds up the best performing players from last week in its team of the week, thus. Daniel Akpeyi (Chippa United): Akpeyi helped the Chilli Boys record a 2-0 victory over Maritzburg United in the PSL, their first in 2019. Fikayo Tomori (Derby County): The Chelsea loanee went the distance for the Rams in their 2-1 win over Reading in the English Championship. 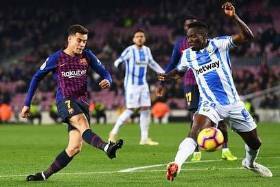 Kenneth Omeruo (Leganes): Omeruo logged the entire duration of their Spanish La Liga clash versus Barcelona at Camp Nou, excelling as one of the best Leganes players despite their 3-1 loss. Ola Aina (Torino): Aina was one of his team's best players in spite of the narrow 3-2 defeat to Italian giants, Roma in a Serie A game at the Stadio Olimpico. Ali Koiki (Swindon Town): Young Burnley loanee, Koiki put in another good showing as Town earned a 2-1 away win over Tranmere Rovers in a League Two clash at the Prenton Park. Oghenekaro Etebo: Etebo put in a solid showing in the middle of the pack for the Potters as they recorded a 2-1 victory over Championship leaders, Leeds at the Bet365 stadium. Samuel Chukwueze (Villarreal): Chukwueze came off the bench to help Villarreal peg back Athletic Club 1-1 in their Spanish La Liga game at the Ceramic Stadium. Alex Iwobi (Arsenal): Iwobi came on to help Arsenal to beat Chelsea 2-0 at the Emirates in their English Premier League encounter. Samuel Kalu (Bordeaux): The 21-year-old laid on his side's winning goal in another sensational showing in the French Ligue 1. Henry Onyekuru (Galatasaray): Galatasaray had the Super Eagles striker to thank after his treble helped them to a 6-0 victory over Ankaragucu in a Turkish Super Lig game. Josh Maja (Sunderland): Red-hot Maja tallied his 15th League One goal for the Black Cats in the 1-1 draw with Scunthorpe United at the Glanford Park.